Specific for independent constantly expressed epitope of lambda chain. Reacts with monomer and dimer forms of free lambda chains but not with lambda chain-bearing immunoglobulins. Mixture of light chains of human immunoglobulin. 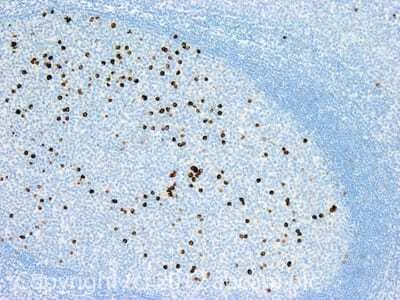 This antibody gave a positive result in IHC in the following FFPE tissue: Human normal tonsil. Our Abpromise guarantee covers the use of ab1944 in the following tested applications. IHC image of Lambda Free Light Chain staining in Human normal tonsil formalin fixed paraffin embedded tissue section, performed on a Leica BondTM system using the standard protocol F. The section was pre-treated using heat mediated antigen retrieval with sodium citrate buffer (pH6, epitope retrieval solution 1) for 20 mins. The section was then incubated with abX1944, 5µg/ml, for 15 mins at room temperature and detected using an HRP conjugated compact polymer system. DAB was used as the chromogen. The section was then counterstained with haematoxylin and mounted with DPX. ab1944 has not yet been referenced specifically in any publications. Publishing research using ab1944? Please let us know so that we can cite the reference in this datasheet. 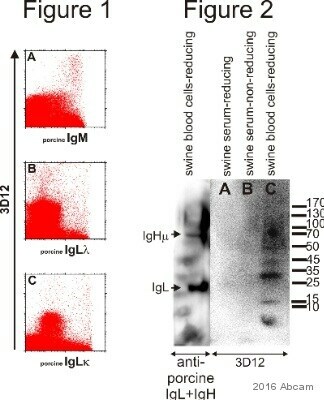 How were these antibodies tested in Western blot (full protocol)? How should plasma samples be used in Western blot with these antibodies? Thank you for your call yesterday and for your patience while I have been in touch with the lab regarding your enquiry. The protocolused for Western blotting was according to Towbin et al. in: PNAS, September 1, 1979, vol. 76, no. 9, 4350-4354: Electrophoretic Transfer of Proteins from Polyacrylamide Gels to Nitrocellulose Sheets: Procedure and Some Applications. Please find this article attached to this email. The lab has not done any testing on these antibodies with plasma samples, so unfortunately we do not have an in-house protocol for this sample type. The positive control used was Bence-Jones protein separated from the urine of a multiple myeloma patient. I would recommend treating the plasma samples as you would treat a lysate, by measuring protein concentration and diluting in sample buffer. The optimal protein loading will need to be determined intrinsically for your particular samples, but the above references should give some idea of reasonable protein loading range.